We've updated the look and feel of our app for iPad and improved the navigation and experience. New features include quick access in the today view in Notification Center as well as 3D touch functionality. Note: Requires iOS 8.0 or above. 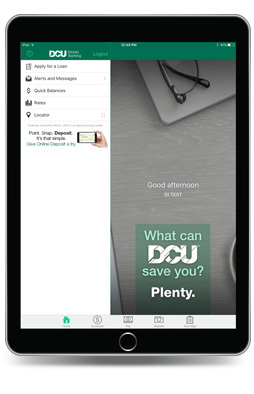 Accounts Overview – Touch the Accounts icon to bring up a list of all your DCU accounts with their current balance information. 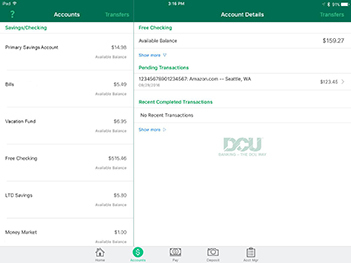 Transfers – Located in the upper-right corner of the Accounts screen, touch Transfers to quickly and easily transfer money between your DCU accounts.